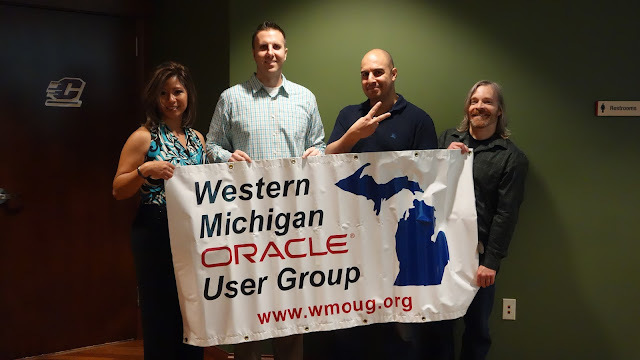 The West Michigan Oracle Users Group (WMOUG), founded in 2000, is a not-for-profit organization and an official partner of the Independent Oracle Users Group (IOUG). The Spring 16 Conference which took place yesterday, May, 17, 2016 in Grand Rapids, Michigan was a huge success with excellent turnout and standout presentations. Rich Niemiec, an Oracle ACE Director and one of 6 originally honored worldwide OCMs, gave the keynote presentation on Uncommon Leaders. Interest was high on this one and the crowd was definitely engaged. Rich is the past President of the IOUG and the current President of the Midwest Oracle Users Group (MOUG). He won IOUG's Chris Wooldridge Award for outstanding service to the user group community in 2012. That year, he authored the #1 Oracle bestseller Oracle 11g R2 Performance Tuning Tips & Techniques. He was inducted into the Entrepreneurship Hall of Fame in 1998. Rich is currently President of the Oracle Consulting Practice of Rolta International. The WMOUG offers a half day event, breakfast, snacks, lunch, 7 presentations, and a wide array of prizes with a 15% chance of winning... all for just $10! For the cost, it is definitely worth it to hear from renowned speakers and meet the sponsors. The crowd from the West Michigan area is a tight knit group, and the beauty of this group is that a lot of people from a lot of companies know each other, giving everyone an opportunity to network with their peers from other companies. Attendees came from Advizex, Amway, Auto-Wares Group, Bissell, Blue Medora, Centroid, Davenport University, Delphix, EMC, Experis, Gentex, HP, Initech, Johnson Controls, Oracle, Perrigo Company, Raastech, Spectrum Health, Steelcase, TEKsystems, and ThinkLiquidity. Prizes included 2 Apple MacBook Airs, an iPad Mini, 2 $100 gift cards, and a few other small giveaways! Many thanks to the WMOUG volunteers, Pat, Mike, Ahmed, and Greg who made this all happen.